Is your mattress just too firm? Are you looking to improve the feel without purchasing a new mattress? The eLuxurySupply memory foam mattress topper could be a good choice for you! 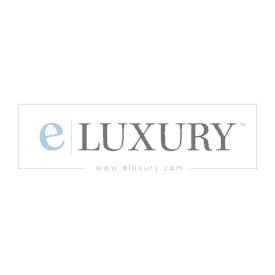 eLuxury has been providing high quality products at an affordable price for the last 5 years. Is this topper going to meet the standards their previous products have set? Keep reading below to find out! Take 30% off your order! Add a little extra hug to your mattress with this body-conforming memory foam topper from eLuxurySupply! Enjoy 30% off your purchase with code SleepopolisReview! Short on time? Click here to jump on down to the review summary. The eLuxurySupply 2″ memory foam topper is constructed from visco elastic memory foam. The topper is designed to create additional pressure relief, body contouring, and great comfort for sleepers. Totaling 2″ in height, this topper is also designed to fit underneath standard sheets as well as the deep pocket sheet sets. With intentions of adding a degree of softness to any mattress, the eLuxurySupply 2″ memory foam topper can add more of a memory foam feel and added softness to any bed. The eLuxurySupply memory foam mattress topper offers quite a nice level of softness to virtually any mattress. Compared to more subtle and cushioned feel of eLuxury’s bamboo mattress pad, this topper provides more body contour and pronounced sinkage. As I first lied down on the topper, I felt the sinkage begin go take place and become increasingly deeper with time. After a few seconds the 2″ topper had fully contoured and my body could feel the interaction point between the topper and mattress. During my sleep tests, I placed the topper on both eLuxury’s 8″ and 10″ memory foam mattresses. For starters, their 8″ mattress is one I am new too and currently testing. My first impression of this mattress, it’s a well built thin mattress with average support and a medium feel. Once I added the 2″ topper to the mattress, the mattress improved tremendously. The topper improved support notably and enhanced the overall level of hug and comfort. Regarding the firmness level, I would say the 8″ eLuxurySupply mattress dropped from a 6 out of 10 on the firmness scale (10 being the most firm) to a 5-5.5 out of 10. In addition, the topper did give this mattress a strong memory foam feel. If you use this topper on a mattress that already has a memory foam feel it will further enhance the feel. Alternatively, using it on a coil or latex mattress will create more of a hybrid feel. I would expect this topper to increase the softness of most any mattress by 10-15%. As I moved onto the eLuxury 10″ gel mattress, it was a slightly different story. This mattress is already solid in terms of comfort and support, but for the sleeper who wants to move to a more true medium feel, this topper is a great addition. While the support was still quite good, the added contour and softness of the topper made for an all around balanced mattress. Not to mention, the increased level of pressure relief the topper offers aided in improving the sleeping experience overall. 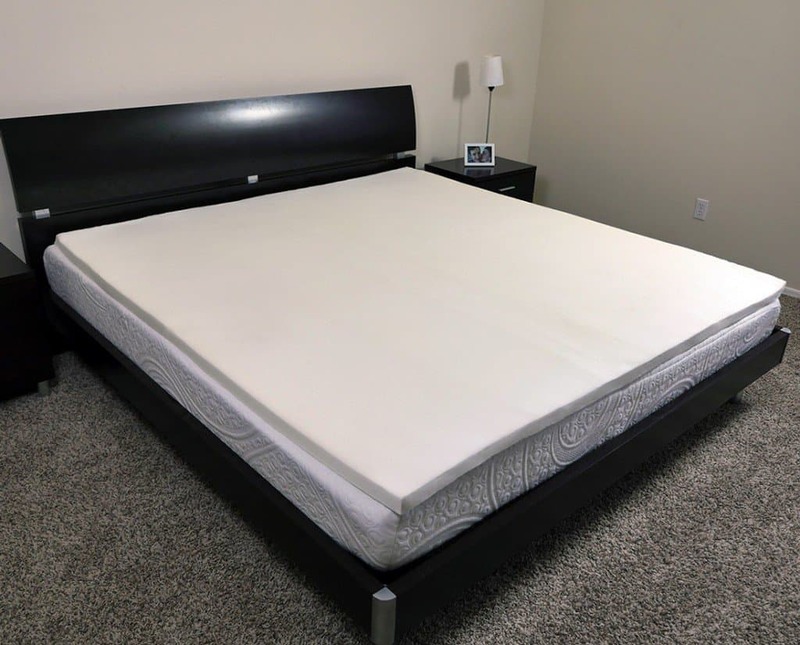 Sitting at a 6-6.5 out of 10 on the firmness scale, the topper took the 10″ gel mattress down about a full point, bringing it closer to a 5.5 out of 10. Next up, let’s talk about cooling. This type of topper is not heat activated, meaning it doesn’t need heat to get softer. At room temperature it has a soft and contoured feel. However, it doesn’t add any additional cooling either. Overall, I felt like the cooling is sufficient for this type of a topper. Most memory foam toppers heat up dramatically. During my sleep tests I did not feel any additional heat retention in the mattress or topper. The increased sinkage that the topper provides will create more material and foam around your body due to the nature of the hug it creates. Some sleepers, especially heavier sleepers, find that this creates too much extra heat. If you’re a very warm sleeper you may be better served with eLuxury’s bamboo padded topper or a latex topper. Finally, and perhaps most importantly, this topper is one of the best deals I have seen to date. For the sleeper who are restricted by budget, this is a perfect fit. Even if you’re not on a budget, this topper is truly a well made product that just so happens to be priced quite low. If you’re a sleeper who has purchased a cheaper mattress and it’s just flat out too firm and / or does not have an adequate level of support, this topper is definitely something to consider adding to your mattress. 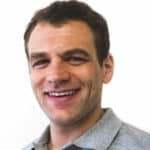 Instead of returning your mattress and purchasing a more expensive one, you could keep your mattress, add the topper, avoid any hassle with returns, and sleep more comfortably (hopefully). All in all, the eLuxurySupply 2″ memory foam mattress topper offers one of the best topper deals I have seen to date. Smell – there was a very light smell after removing the topper from the packaging. This odor was gone in less than 48 hours. Who should buy the eLuxurySupply memory foam mattress topper? Want to soften up their mattress – adding the eLuxury 2″ memory foam mattress topper to a mattress tends to soften it up anywhere from half a to a full point on the firmness scale, anywhere from 10-15%. For example, the 8″ eLuxury mattress typically sits at a 6 pout of 10 on the firmness scale (10 being the most firm) and the topper brought it closer to a 5-5.5 out of 10. 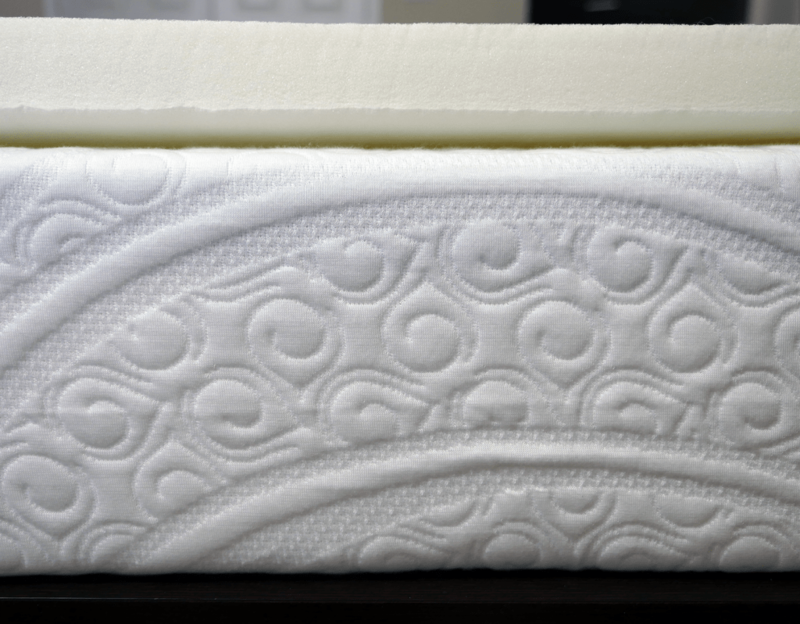 Want more sinkage and body contour – this topper creates a classic memory foam feel with pronounced contour, sinkage, and hug. Want a great deal – at $56 for a Queen ($47.60 with this link), it is very hard to beat this topper. It’s an impressively good value. Want to purchase from an established company – eLuxurySupply has been creating quality bedding products at an affordable since 2012. If you’re looking to purchase from a reputable and established company, eLuxury should be at the top of your list. Questions or comments? Please drop me an email via my contact form. 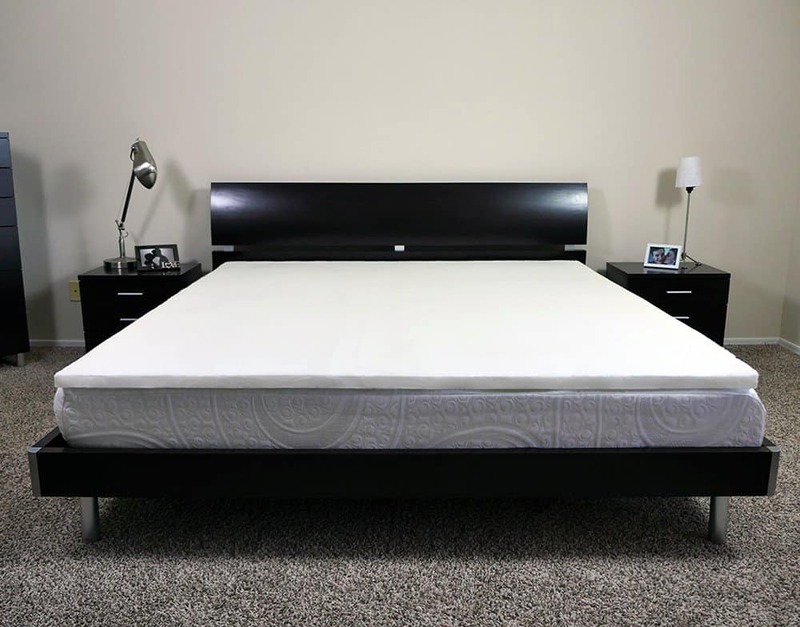 For more information on the eLuxury 2″ memory foam mattress topper, visit eLuxurySupply.com. 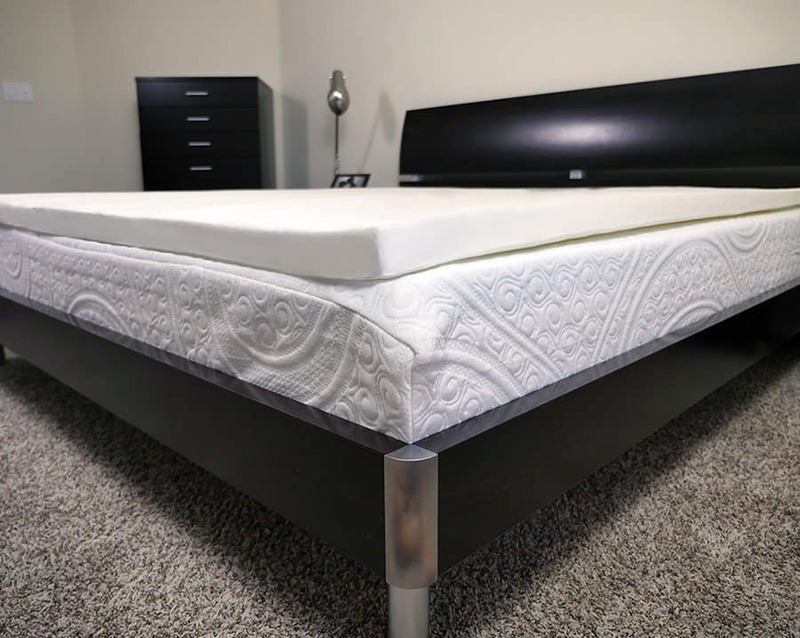 The eLuxurySupply 2″ memory foam mattress topper is soft, provides a good balance between sinkage and hug as well as body contour, and adds a slight degree of support to most mattresses. If you’re looking to soften up your mattress, but avoid spending a fortune, this topper is a great choice to consider. It’s quality build and extremely low price point make it a great option.